“These two were over in the garden,” he said sternly. I glanced over at the boys, both holding a plastic sack that contained what looked like a fistful of greens. The boys were opposite in appearance except for the fact that they both looked down at the carpeted floor, not willing to make eye contact. “You were in the garden without permission?” I asked. They nodded. “Are you hungry?” They shook their heads. “Do you need food?” I asked. 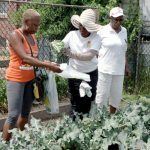 “We saw this garden and we thought we would do something nice and pick some collard greens to take home,” the larger of two said. The other nodded in agreement. I raised a brow, slightly amused and certainly now more curious. 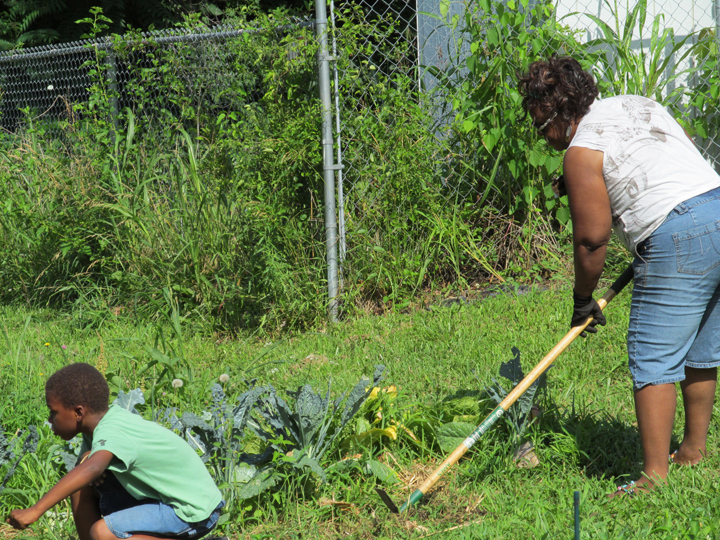 “You know what a collard green looks like?” And together they said, “Yes.” The next day the boys were to meet me at the garden to “work” off their infraction by pulling weeds, to learn about responsibility and stewardship and to understand the difference between collard and mustard greens. And that’s how it began. The Garden Posse Boys: that’s what we call them now. 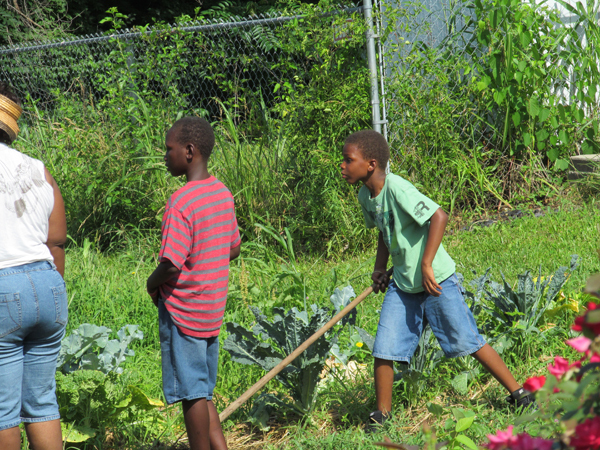 No longer two in number, the addition of brothers and friends now makes six or seven young guys who stop by the center almost every other day to see what needs to be done in the gardens. One boy has sickle cell. Another is slightly overweight, but wise beyond his years. Another, the oldest and biggest boy, was bent over pulling weeds when a man stopped in the street, looked over and yelled to him, “You are supposed to be at football practice, man!” The burly linebacker, looked at me with a smile, grabbed his bottle of water and began to jog off — but not before yelling over his shoulder, “I’ll be back Ms. Dina!” I smiled and waved back. He was a new face, and I couldn’t remember his name. 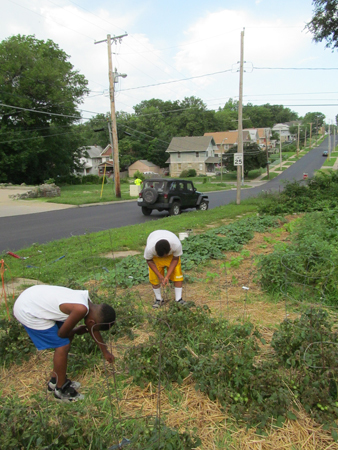 Since then, the Garden Posse Boys are working side-by-side with our own Grown in Ivanhoe Certified Growers and the Master Gardeners of Greater Kansas City-University of Missouri. One fellow got involved with Ivanhoe Positive Alternatives Cooking Class. Four of the boys are now growing at least one thing in a shared plot in the very garden they pilfered. And others are sharing lessons they continue to learn upon a small patch of ground.